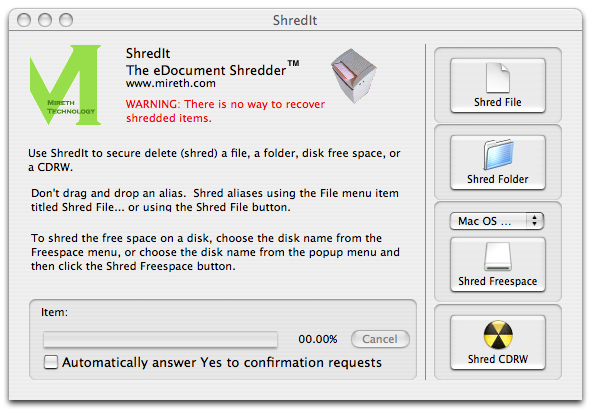 [prMac.com] Vancouver, Canada - Mireth Technology Corp. has released version 5.8.4 of ShredIt X, its simple to use file shredder and hard drive cleaner software for Mac OS X. Version 5.8.4 adds support for DOE standard compliance. With the addition of the Department of Energy standard, ShredIt X now provides support for the four most prominent security standards - Department of Defense 5220 standard, NSA standard, DoE standard and Gutmann standard. ShredIt is easy-to-use privacy software for Mac OS X that erases data so it can't be recovered. It can be used to erase files, folders, disk free space, previously deleted files, hard drives, external drives, network drives and CD-RWs. ShredIt comes with a wide range of features, including built in safety features along with advanced shredding features such as, government standards compliance and a configurable overwrite pattern. ShredIt X is available for immediate download, or on CD-ROM, starting at $24.95 (USD). Registered users of previous versions of ShredIt X can upgrade for free. Educational pricing and volume discounts are available. ShredIt X runs on Mac OS X. ShredIt is also available for Mac OS 7, Mac OS 8, Mac OS9, Windows 95, Windows 98, Windows 2000, Windows ME, Windows NT, XP and Vista. For more information, visit their website. Founded in 1991, Mireth Technology Corp. produces easy-to-use and cost effective Macintosh software, including ShredIt, NetShred, iVCD, Music Man, and MacVCD. Mireth is well-known in the industry for providing robust, well-tested products and outstanding customer support. A Vancouver based corporation, Mireth Technology produces "The right software for the job." Copyright 1991-2008 Mireth Technology Corp. All Rights Reserved. Apple, the Apple logo, and Macintosh are registered trademarks of Apple Computer in the U.S. and/or other countries.